For both carboys and buckets. In our opinion 3 piece airlocks are superior to the triple ripple type in that they can be taken apart and cleaned. However we do sell the triple ripple type (FE371) in case you are use to that type and would like to stay with it. Please Note: Stopper Not Included. To keep out unwanted organisms! Works great with tubing to capture overflow for the first week of fermentation. What is the trick for adding a blowoff tube? I use a 1/2 in. tube and it breaks the airlock first use, even if i put silicone on it. BEST ANSWER: Hello Adam - 3 piece airlocks are best to be used when fermentation has calmed, or there is plenty of headspace for krausen. An easy blow-off solution is putting ~5/16" OD hose through a stopper, then into a bucket of sanitizer. I use both types I like that these can be cleaned out completely with a brush. Bought these as a replacement for originals that i have broken, or lost pieces too. They are effective. No issues, these work great! 3 piece airlocks work great. These are my go to Airlocks! Been using this type of Airlock for many years. It's an Airlock. It works. As the title suggests, it works. The lids can be a bit of a pain to get off, but it's cheap plastic. Does it's job. Even being more conversing then the simple S style airlock, I will always take a three piece. These are beautiful. You can tell they are fresh from the factory. Standard airlock, not much to say other then it works great its my preferred type. Works as advertised. Nothing special. Gets the job done. These work great, but, if the top ages and breaks, you cannot just get the tops. But when I found that out, I found that you can use the caps from Rx bottles, they fit perfectly. I won't use other airlocks. These are simple, easy to keep clean, and effective. What more do you want? You can fill it with water, vodka, or sanitizer and it works just fine. Work just like they should. Easy to clean 3 piece unit. Easy to clean, easy to fill (I use vodka, rather than sanitizer when I ferment) and reliable. These are the only airlocks I trust. Love em. Been using them for years. I have a few of these. All work great and easy to clean. I would recommend. No issues, works like a charm. Cheap and reliable. If you don't like the screen on the tip, it snips off easy. Have had no trouble with this at all. These are indispensable. Have not tried the S-shaped because of negative reviews. This is a good airlock. I suggest keeping an extra one around in case it breaks. been using these for years. Can't be beat. Easy to use and clean. Cheap too. Buy a few extra just in case. I would like someone to make a better quality air lock. It seems that some are much more fragile than others. I like these better than the old s-curve airlocks. These are easier to clean, and cooler looking. I always keep an extra one on hand. Airlocks are great, but can get clogged if used alone deepening on Carboy size and how vigorous the fermentation is. I would suggest turning the airlock into a blowoff tube. You can do this by buying a tube to fit around the the plastic top of the airlock. I have always used these on all my secondary fermentations. I have used them on a primary or two for smaller gravity beers I don't expect to have a violent primary fermentation. However, I have had them clog in the past so I usually lean on the side of caution and use a blow off tube. My only gripe is the liquid level lines are sometimes difficult to see but all in all a solid product every home brewer should have. Works great and does what it needs to do. Need to have these if you're brewing. Works just like an airlock should. Easy to use. Easy to clean. Inexpensive enough that you should order a few just in case you lose a piece down the sink disposal. Though the bubbler airlock looks so classic with it's "s" shaped design, after you've tried to clean one you know why people prefer this model. These three piece airlocks are both easy to use and clean. Combine this with a stopper and you're ready to go! I use a carboy hood with a blow-off tube for the first few days of fermentation then switch to this bad boy. Never had a problem yet! I have two of these that I use. Feel a bit frail but they have always have worked just fine. These are easier to clean than the one piece bubbler style and cheap enough to replace every so often when they get nasty. I buy these often as it's always good to have some spares around. Works as it should. I have resorted to only using airlocks on my secondary fermentation though. I have had it clog a couple times during my primary and I now use a blow-off tube for those. I've rigged up several types of airlocks over the years, but always have some of these standard plastic bubblers on hand. I usually make the holes in the top lid a bit bigger by sticking a toothpick in them. But for standard bodied beers, these things work great. Keep them topped off with water and everything goes fine. Big bodied beers, you're better off using a blow off tube until the fermentation settles down. And then attach the bubbler. Works perfectly. Easy to clean. I had a few of the S type airlocks, but had to toss them because they won't come clean. These 3 piece airlocks work great and are easy to clean. I use these on my secondary, while letting a brew finish. It does what I need it to do. I've never had a problem with this air lock. 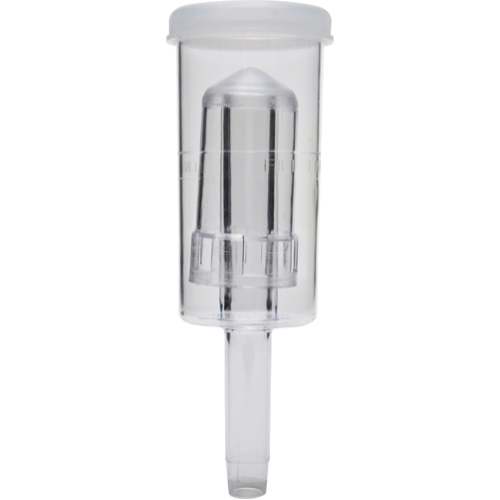 If you have a really active fermentor, this airlock is easy to clean. I usually switch to an S-type airlock later to see when activity is nearly done and there is little chance of yeast getting into the airlock. I have never had a failure of these airlocks! Which I can't say for others. I replace these all the time. For the price you can't go wrong. Easy to replace and easy to monitor. I read a lot of forums that stated these air locks would replace blow off tubes. NOT SO! However, I'm not going to fault the air lock for that which is why it still gets 5 stars. For primary fermentation, I still start with a blow off hose. I like that the parts are easy to clean. I feel I can keep these in a much more sanitary condition than the "S" style air locks. Easier to clean. Buy plenty. Since switching to the 3 Piece airlock I have had fewer clogging issues. Standard issue 3 piece airlock that works like a champ! Easy to clean, easy to use, better than the 1-piece airlocks. A 1/2 vinyl tube fits over the internal port for adapting to a blow-off valve. All was have back-ups, there cheap.